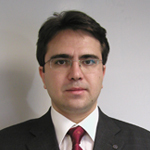 Dr. Pasaogullari received his Ph.D. in Mechanical Engineering from the Pennsylvania State University in 2005. He earned his B.S. degree in Mechanical Engineering with high honors from Middle East Technical University, Ankara, Turkey and M.S. degree in Mechanical Engineering from the Pennsylvania State University in 1999 and 2003, respectively. His current research focuses on thermal and water management in polymer electrolyte fuel cells, and characterization of the effects of heat and water transport on performance and durability of these systems. He was appointed as Castleman term professor in 2016.